Transform your smile with veneers from May St Dental Centre! If you look in the mirror and wish your smile looked perfectly aligned and gleaming, veneers may be the perfect solution for you. We provide them in porcelain or composite materials that can suit any lifestyle or budget. Porcelain is a strong material that closely resembles natural teeth yet are resistant to staining. 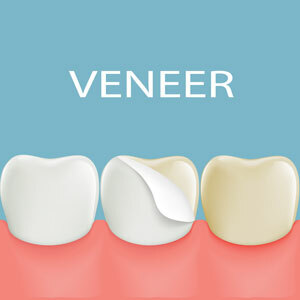 The biggest advantage of choosing composite veneers is that they are less expensive. We’ll talk to you about which material we recommend for your case, but both can give you the dazzling results you seek. The first step is to have an evaluation with one of our dentists. At this appointment, we’ll talk about your goals and make sure that your teeth are healthy enough to have the veneers applied, as well as discussing which materials are best for you. Once you’re ready to move forward, we’ll prepare the existing teeth to receive the veneers, removing a minimal amount of enamel for a seamless fit. Photos and impressions are taken so that we can choose the proper shade and shape of the veneers. The information is then sent to our Australian laboratory where the veneers are custom-created. When completed, they will be sent back to our practice, and you’ll return for a follow-up visit. We’ll bond the veneers into place, then polish and shape them for a gleaming finish. Porcelain veneers are considered to be a permanent restoration since they are bonded to the surface of your teeth. They are made of porcelain, a very strong material, so it is rare for them to chip or fall off. In the unlikely event that this does happen, however, the veneer can be repaired and bonded back into place. Veneers aren’t subject to staining or other forms of damage. It’s important, however, that you still brush them and floss between the veneers to keep the teeth underneath and the supporting gum tissue healthy. Along with your biyearly dental checkups, these healthy habits ensure that your veneers last for years. Contact us today to discuss if veneers East Fremantle are right for you! DentiCare payment plans are available.